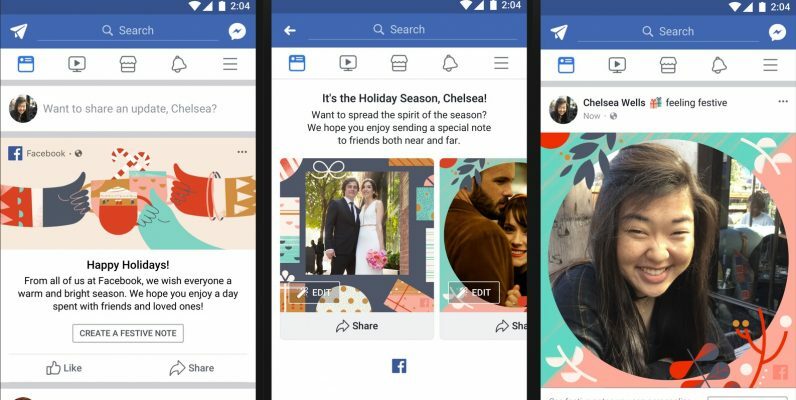 Facebook today began to roll out a suite of new holiday features to raise the spirits of its millions of users. The most useful cheer update is probably the holiday cards you can send to family and Friends. You can customize them with special photos and messages, and the designs are cute, if generic, holiday designs involving stars and doves. As we get closer to the end of the month, the site’s users will be able to use a number of holiday backgrounds in their updates. Most of the other holiday effects involve the Camera. Facebook will be adding time-exclusive stickers and Live effects in celebration of Christmas, Hanukkah, and Kwanzaa. For example, in Facebook Messenger’s video chat you can add Santa and Rudolph filters, along with colorful Christmas light frames. For those who are going to be spending their holiday energy on the New Year celebration, Facebook is adding effects to its Live broadcasts exclusive to the Eve celebrations. You’ll also get to see a montage of your friend’s holiday pictures starting on December 28th. Overall, this seems like a pretty cheerful update, so Scrooges might want to avoid Facebook for the next couple of weeks. The last holiday item in Facebook’s calendar is a New Year retrospective on January 4 and 5. Read next: This 6-year-old made $11M on YouTube last year. What are you doing with your life?